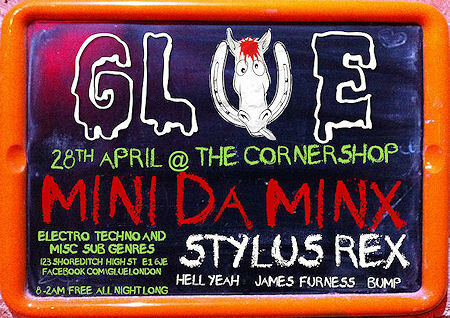 « Glue at The Cornershop this Saturday! I had the honour of playing the closing set at Glue last night. Following an awesome headline set from Mini Da Minx left me with no option but to blow the doors down! A few friends who couldn’t make it asked me to record the set, so here it is – 45 mins of unadulterated bass music (would have been an hour, but the bouncers were very insistent that I had to finish 15 minutes early, much to the disappointment of the crowd)! This entry was written by James Furness, posted on April 29, 2012 at 6:31 pm, filed under Podcasts and tagged Breaks, Electro, Techno. Bookmark the permalink. Follow any comments here with the RSS feed for this post. Both comments and trackbacks are currently closed.